‘FRENCH PLATED’ BRASS [PART 2]: IDENTIFYING I.D. ‘WITH A CROWN ABOVE’. 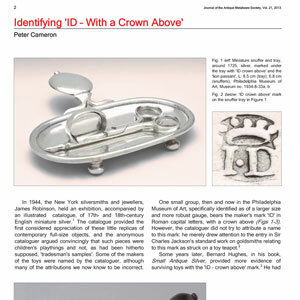 An article printed in the ‘Antique Metalware Society Journal’, Vol. 21, 2013. This essay, following on from the article on Anthony Christian, explores the work of another maker of articles in silver and ‘French plated’ brass in London in the first half of the 18th century.